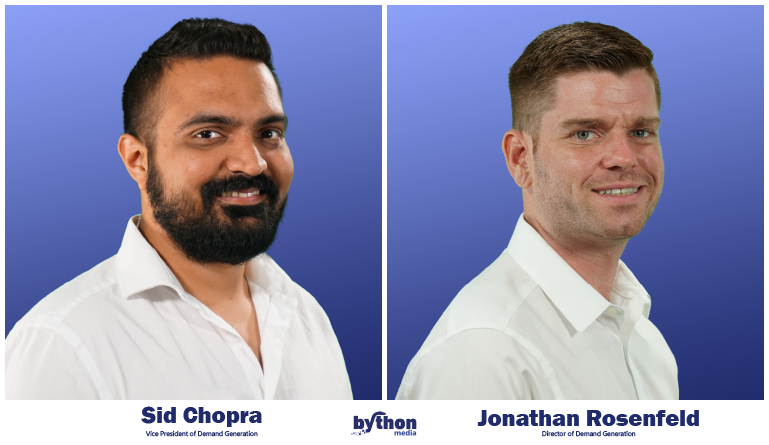 Bython Media, a leading digital publishing and B2B marketing company, announced the expansion of its sales and marketing team by promoting Sid Chopra to Vice President of Demand Generation and hiring Jonathan Rosenfeld as its new Director of Demand Generation. Sid Chopra previously served as AVP of Strategic Alliances. He brings ten years of successful sales, strategy, and operations management experience to his new role, as well as a keen knowledge of building lasting client relationships. Prior to Bython, he played a key role in helping several companies successfully connect with thousands of potential customers. Jonathan Rosenfeld is an accomplished digital marketing professional with over 14 years of experience. He has a rich history in demand generation, content marketing, and strategic alliances. Before joining Bython, he assisted a variety of clients such as Citrix, American Honda, and Universal Music Group with achieving their marketing goals. Chopra and Rosenfeld will focus on helping clients increase quality B2B opportunities and expand brand awareness through specially-tailored demand generation initiatives, including content syndication, account-based marketing, and digital marketing. This is the latest in a series of moves by Bython Media to achieve its goal of becoming the primary source for companies and executives seeking quality solutions in the publishing and marketing fields. For more information about the company and its media properties, please visit Bython.com, OnlineWhitepapers.com, TechFunnel.com, and List.Events. Based in Frisco, Texas, Bython Media is a global digital publishing and marketing company with a passion for providing information and solutions that help businesses grow, adapt, and succeed in the constantly evolving world of technology. Its online properties deliver first-class content focusing on trending and emerging technology, research, and events. The Bython marketing team specializes in data-driven B2B solutions that help clients connect with customers on a deeper level and amass high-quality opportunities through its network of almost 30 million contacts.